Consisting of a high powered transmitter and rechargeable receivers, the system offers the option to use headsets or neck loops. A 5 slot charger is also available and, if you only need one or two receivers, you can use any USB charger – too easy! The supplied bracket makes installation and set up quick and easy. IR is an ideal solution when retrofitting a Hearing Assistance System. It is also a great option if you need confidentiality in Courtrooms or Meeting Rooms. The system can be set up in either stereo or dual mono mode, making it ideal for listening to program sources or language interpretation. Suitable for most applications, from small meeting rooms to large school halls. 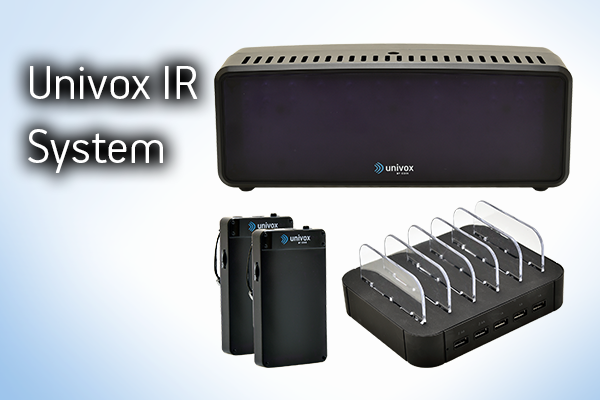 The new Univox IR system is a fantastic option and very cost effective. 50Hz – 18kHz (+/- 1 dB) sounds fantastic! For more info and brochure, click the link below. Please call us now for more information, pricing or to arrange a demo.